Following my education, I began teaching art in various traditional venues. 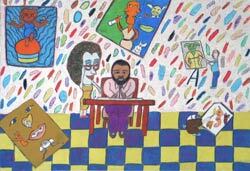 I was never quite satisfied, or enthusiastic, about any of them until I took a job teaching painting and drawing in Oklahoma State prisons to men and women incarcerated in medium and maximum-security facilities. That clicked. That was where my heart found its home, and that is the population I've been working with ever since, for the last twenty-five years. "Art Teacher" didn't seem the right job description after a few weeks of working behind bars. Some of the men and women had already created strikingly fresh work without benefit of an art program or decent materials. Teaching the conventional principals, techniques, and subject matter—in other words, what was taught to me—not only seemed irrelevant, but that such an approach was likely to put a lid on the intense yearning to create what was obvious, and poignant, in most of the people who came to my classes. I thought perhaps "artist facilitator" was a more appropriate job description— provide space and materials, protection for the work, opportunities for exhibition, and minimal, gradual guidance away from cliché and into the new. These days, I can't help thinking of myself as an excavator. Facilitator doesn't seem to match the urgency I feel to unleash the force for goodness that is the creative impulse. I am vigorously engaged in something analogous to digging for gold. With every person I meet, behind bars for six months or twenty-five years or life, I begin with the certainty that they have within them the wherewithal to make truth, beauty, and goodness visible and tangible. The gold is there, almost always. It might already be actualized, shining, as with a few of the exceptionally talented self-motivated people, or just under the surface, ready to burst forth. Or, it might require excavation. The obstacles, layers of mud and dust to be swept aside, shoveled out, or blasted to smithereens, are the fixed images of self, mostly negative, that the great majority thoroughly believe themselves to be. It may be true that they have done bad things, and most have actually been victimized themselves, but it is crucial that they begin to experience the potential for goodness and the capacity for autonomy that is inherent in being human. In my art class there are no pictures of hearts and roses, praying hands, spider webs, tearful eyes, tattoo flash, or any of the other stereotypical jailhouse imagery. And there are no generic scenes of lighthouses, covered bridges, city skylines, and all the other shopworn subjects that are stereotypes on the outside. I am not saying that making this kind of popular art is not a good thing. It is very good, no matter what the quality, because the making of it is a peaceful positive endeavor, releasing stress and engendering cooperation among the inmate population. People teach each other how to do it. They keep up their family ties by sending work home. They earn and give respect to each other for their artistic accomplishments, but art class is a different story. Art class is designed to effect real transformation that is only achieved when a person can see and touch a truly inventive, excellent, inspired work of art that they themselves have created from a source that is deep and mysterious. Do not express these. You can of course think whatever you are thinking – feel whatever you are feeling – but do not speak it aloud. This works magnificently. Something new and deep is given access to express itself. Something good, fresh, energetic, and positive. Check out the difference between, "I can't draw horses," and "I would like to learn to draw horses." The former slams a door shut. The latter opens to possibility. When someone in the group does inadvertently express negativity, the others jump on it before I do. They are good-natured about it, but we all know that if it continues, the offender will have to leave. In this art class it doesn't matter how you feel. It only matters what you do. At the very least, adherence to these rules reduces the volume of the ego's fears and negativity. At best, the authentic self, which is goodness, takes over completely, and there is an explosion of creativity that surprises everyone. It is my observation that the best art (and the best self) rises to the surface when its creation is not fundamentally motivated by personal gain. 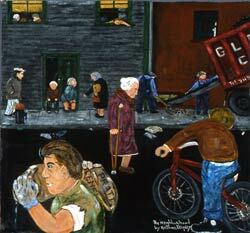 I encourage people to think of their artwork as a gift to the world. At this, they sit up straight and proceed with focus and dignity. The idea is to change the culture - to shift our core values from getting to giving – in prison and elsewhere. The gold, unearthed, is for everyone. 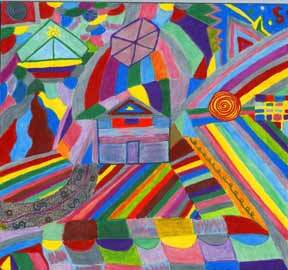 Phyllis Kornfeld is the author of “Cellblock Visions: Prison Art in America.” She has been conducting visual arts programs with incarcerated men and women for twenty-five years – from county jail to death row - in eighteen institutions in seven states. She is presently holding weekly classes in five correctional facilities in the New England area. 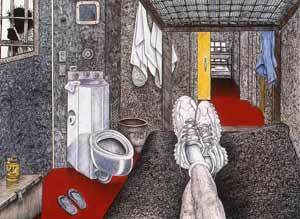 Kornfeld curates exhibitions of the work and lectures on prison art at universities, museums, and conferences.